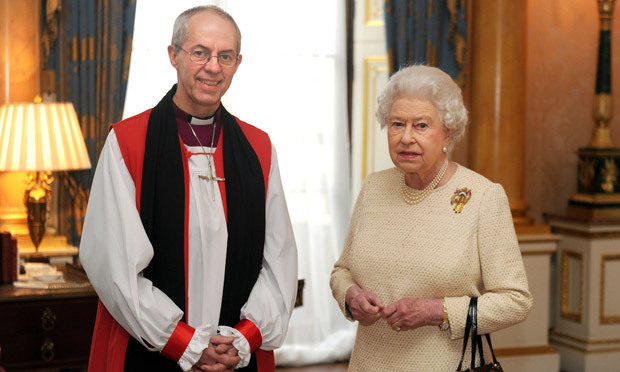 The current Archbishop of Canterbury, Justin Welby, with the Queen Elizabeth. Through an era of unprecedented change and social revolution, she has been a rock of majesty; an anchor, compass and counsellor to 12 prime ministers and seven archbishops of Canterbury. When it has rained, her sun has shone because the Son dwells in her heart, transforming to the likeness of saintliness, servanthood and sacramental kingship. You may think all this smacks of obsequious fawning and sycophantic hyperbole: you know nothing of the image of God. Source: Elizabeth II becomes our longest-reigning monarch – God Save The Queen! This entry was posted on	September 10, 2015 at 9:36 am	and is filed under Uncategorized.